But only if you are very lucky. Nowadays, the second day of Christmas gift from the traditional song is highly unlikely to be given by anyone’s true love. Apart from the fact they spend their winters in sub-Saharan Africa, these beautiful doves have declined by 91% in the last twenty years. Their scientific name Streptopelia turtur comes from their gentle ‘turr-turr’ song. You may be lucky to hear one in the village in the summer, although I haven’t heard one here for two years now, but they can still be heard in Kent which is one of its last UK strongholds. The area between Ashford and Marden has been designated a ‘turtle dove friendly zone’ where many farmers are catering for their special needs. They need weedy patches of bare ground, with tall, thick hedges for nesting - as explained on a recent BBC World At One broadcast http://www.bbc.co.uk/programmes/p05p32nk - something becoming increasingly hard to find in our intensively farmed and ‘tidied-up’ countryside. A delayed Christmas gift of seeing a turtle dove next summer would certainly be one worth waiting for! A number of birds are included as gifts in the seasonal song, although no-one really knows for certain why. A plausible theory is that the original ‘numbers’ were chosen to represent religious symbols at a time when these were banned during The Commonwealth. The two turtle doves, for example, represent the two testaments of the bible, the six geese-a-laying is code for the six days of Creation, and so on. The single partridge in a pear tree is the resurrected Christ lifted aloft – pear tree rhyming with ‘perdix’, the French for partridge. 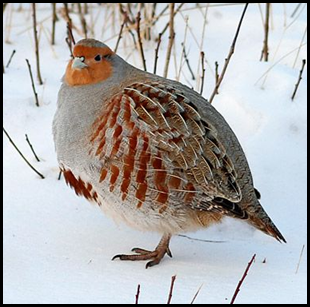 Sadly, the partridge in question is the Grey Partridge (known as the English partridge), yet another endangered species as a result of modern farming practices. The commoner Red-Legged (or French) Partridge is an introduced species ‘farmed‘ for shooting purposes. A bird that is fortunately still very common is the wren – I doubt there is a garden anywhere in The Farleighs, or in any village from here to the northernmost outpost of the UK, that doesn’t shelter this tiny bird. You probably hear it more often than see it, as it tends to keep out of sight in a never-ending search for food, hence its scientific name Troglodytes troglodytes - the cave-dweller. It too has been the subject of a Boxing – or St Stephen’s - Day custom for centuries. No-one really knows the origin of ‘Hunting the Wren’: a pagan ritual to mark the winter solstice, or a Christian one to mark the apparent part the bird’s unusually loud song played in disclosing the hiding place of the Christian Stephen? As a result, Stephen was allegedly stoned to death, a fate that used to befall the unfortunate wren captured as part of the ritual. 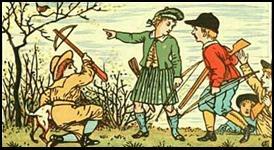 Apparently the custom is still partly enacted in parts of Ireland and Wales, but with a token, not real, wren that is carried from house to house by children soliciting sweets! The familiar Robin, of course, is probably the bird most associated with Christmas – being featured on countless Christmas cards, decorations and even a Waitrose TV advert! Many people refer to the one in their garden as ‘our‘ robin as it is there keeping them company throughout the year. But there is a strong chance that ‘our’ robin has moved to warmer parts of Europe for the winter, and its place taken by a Scandinavian bird enjoying the usually mild Farleighs weather! If we are lucky, robins (and wrens) will serenade us on our post-Christmas dinner walk around the village. Finally, if you are fortunate enough to hear or see a turtle dove or grey partridge in the coming year – please let me know. It’s important for conservation bodies and landowners to know where these species are so that appropriate action can be taken to ‘bring them back from the brink’. Celebrating Christ’s birth would be so much more meaningful if, for the rest of the year, we took more care of the world He created. Happy Christmas. Hi Duncan - a grey partridge! Where abouts in Marden are you? I do a lot of survey work there on Peter Hall's land but we haven't recorded a grey partridge for a couple of years - the last was on Poultry Farm in Plain Road. If we know where they are we'd be happy to put out supplementary feed for them. As Santa himself would say: Ho, ho, ho! Thanks for the info on the woodpecker Ray. 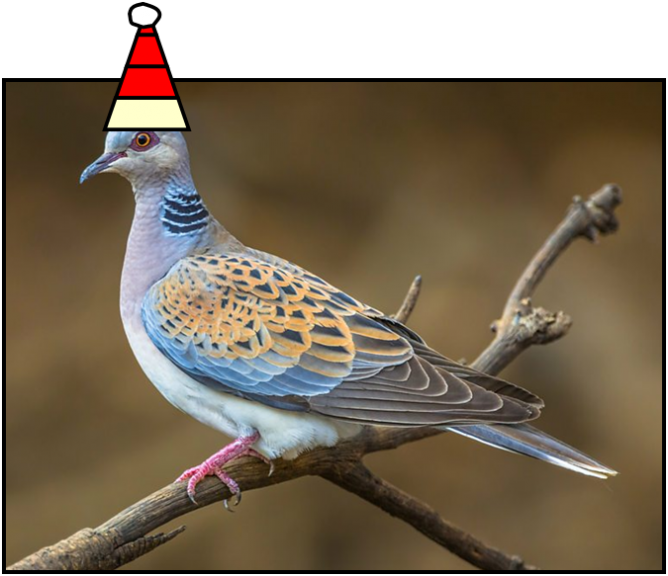 I'm keeping an eye out for Turtle Doves, but haven't seen any birds with Christmas hats on yet, do they all wear them? It's actual quite normal to see green woodpeckers in fields, or anywhere they can have access to rough grass. They feed on insects and their preferred food is ants! Although they use their strong bills to excavate holes for nesting (one started on a nest hole in an apple tree in my garden - the chippings on the ground looked like someone had taken a chainsaw to it) they have extremely long tongues to seek out insects in nooks and crannies. If they can open up an ants' nest they have a cornucopia of food they can access with their tongue. When they are on the ground for a long period you can get a good view of them too!